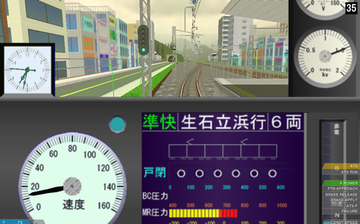 A fictitious Japanese EMU class 12. The train consists of 6 cars, of which 3 are motorized. Driver's stand with speedometer, digital manometers (pressure gauges), clock, pilot lamp, and indicator lamps for power and brakes. The creator's website (Japanese text). Use the 4th download link from the top of the page.